See that big braided rug? It was my TV project over the last month. I’ve always wanted to make one, and I finally decided to do it. A normal person would have started with something smaller, but I wanted an area rug for the living room at our cabin, so I went big. Really big. That rug is almost 5’x5’. And you know what? It was actually a really fun project. 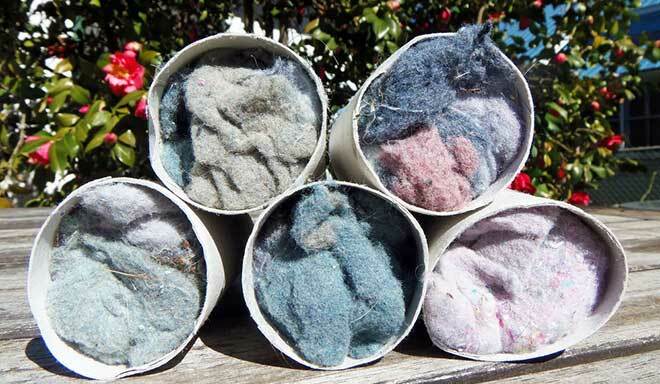 Want to try your hand at rug making? Here’s how it’s done. They can even have stuff printed on them. It doesn’t matter. This is a good time to get all of those promotional tees cleared out of your drawers. If you have a certain color scheme in mind for your rug, pick your shirts accordingly. I needed a lot of shirts for my rug, and I wanted it to be really colorful, so I hit the clothing bins at my local Habitat thrift store. They’re fill a bag for $1. I filled nine bags, and have lots of shirts left over for another rug. Every time I dug through the bins, I found things that my kids needed, so I really consider this to be a free rug. Just a couple tips to help you pick out your shirts: I found that the thicker tees worked best. I used the sort of t-shirts that you’d get free at an event, as well as store-bought solid-colored tees, and the free tees worked much better. They’re thicker, and they stretch better. I’d also recommend trying to pick shirts with a similar weight. It’ll keep your braids consistent in size. You can either make all your yarn at once, or make it as you need it. I made up a ton of yarn before I started, but later switched to making it as I needed it. That seemed to work best for me because I could pick my colors as I went, and just cut up t-shirts accordingly. I ended up not using some of the yarn that I made in the beginning. Making the yarn is actually really easy. 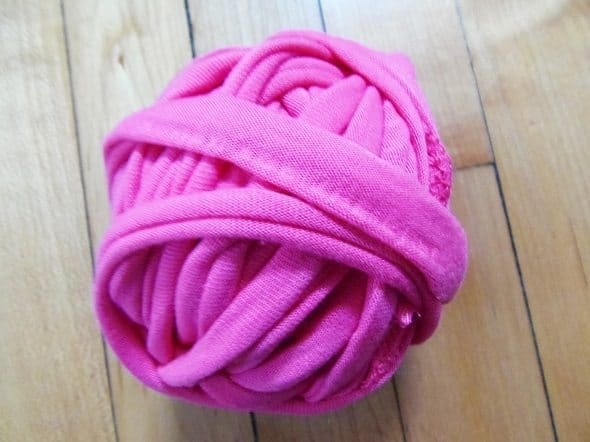 It’ll probably take a few shirts for you to get the technique down, but after that you’ll be able to turn a t-shirt into a ball of yarn in just a few minutes. Lay a t-shirt out on your work surface. Measure two inches up from the bottom of the shirt. 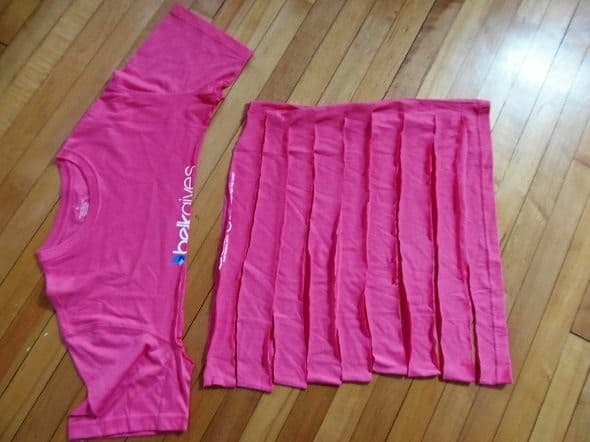 Then, cut across the shirt (through the front and back), stopping a couple inches before you get to the other side. Repeat this process over and over until you reach the arm pit seam. For that row, you want to cut all the way across, to separate the top of the shirt from the cut portion. Just set the top aside for later. 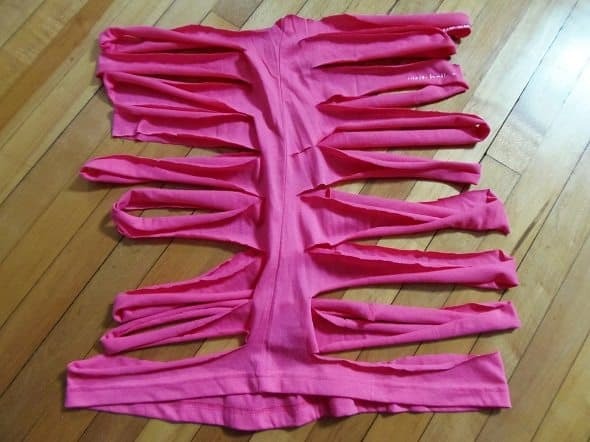 Now, stick your hands inside the shirt, and spread it out, so that the uncut seam is at the center of your work space. 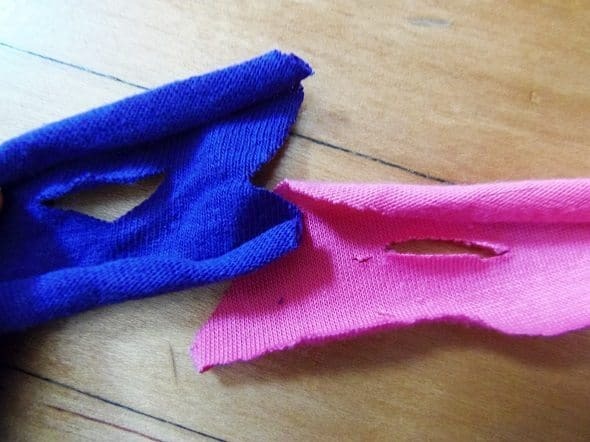 This will leave you with cut ribbons on either side of the seam. 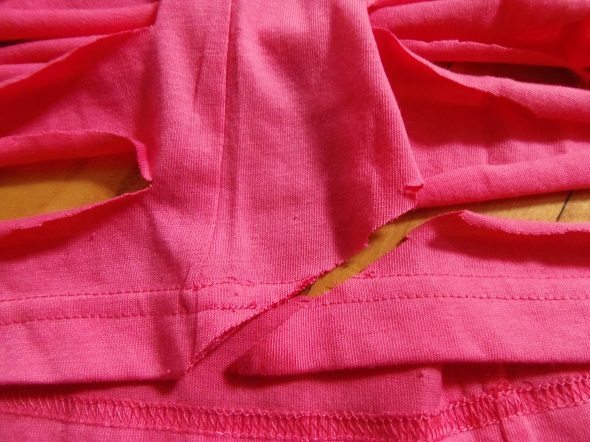 Start at the bottom of the shirt, and place your scissors at the center of the uncut seam. Cut up at a 45 degree angle, until you hit the first row that you cut. Then, move up to the first cut row, and cut from the left side of the seam, up at a 45 degree angle, until you hit the next row. This will put you on the right side of the seam. 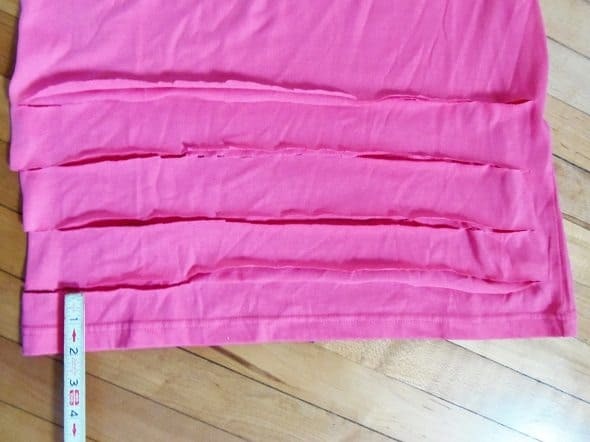 Continue to move up the rows in this manner, until you’ve cut the last seam. When you’re done, you’ll have one long piece of t-shirt yarn. Here’s a diagram to help you visualize those steps better. 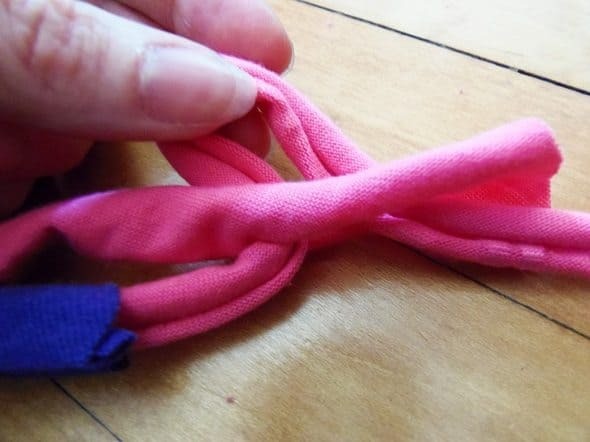 Stretch the yarn to make the edges curl in on themselves. 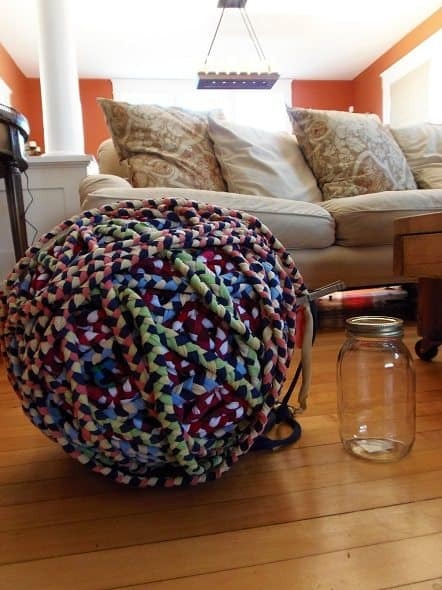 Then, roll the yarn up into a ball. Pick out three colors of yarn. 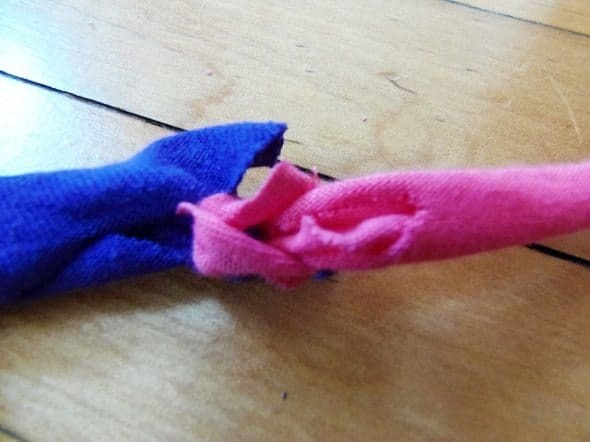 Tie the ends together with a knot. Then, start braiding. Keep your braid tight as you go. I found it easiest to hold the end of the braid between my legs as I worked. As it grew, I just let the finished braid fall to the floor. 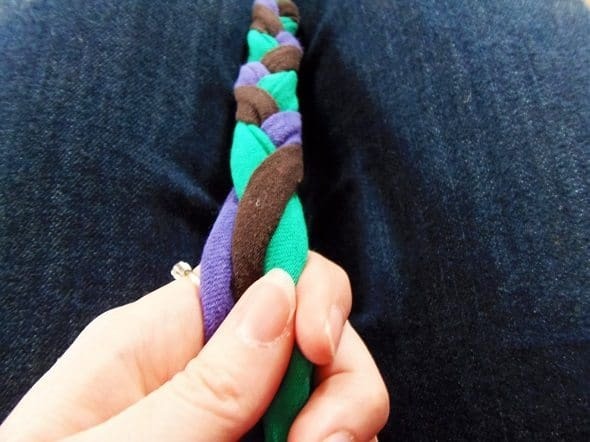 In the beginning, the braiding felt really awkward because instead of moving the strands around, as you do when you braid hair, you actually have to move the yarn balls. It feels a bit like juggling, but it didn’t take long for me to get used to it. Whenever I took a break from braiding, I stuck a clothespin at my stopping point to keep my braid from unravelling. I opted to do all of my braiding first (some people opt to sew their rug as they go), so I just wound my braids up into a big ball as I worked. I added more yarn by cutting a small slit in the new piece and the piece that I was attaching it to. and fed the end of the new piece through the slit in the new piece ..
and pulled it tight. (It’s kind of hard to explain in words, but hopefully the pictures will do a better job of explaining it). 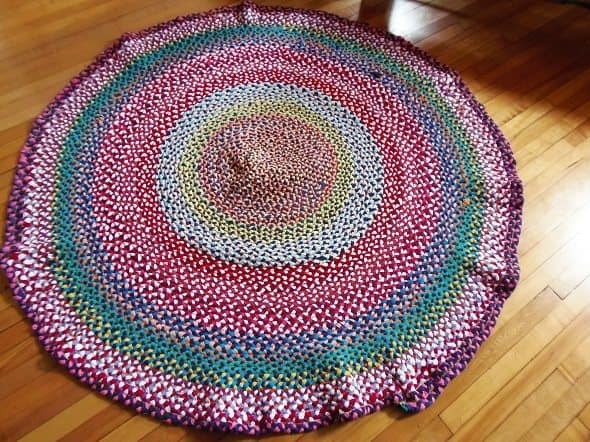 I braided for a couple hours each night until I thought I had a ball that would make the size rug I was after. You’ll just have to guestimate (I don’t know of any other way to do it). 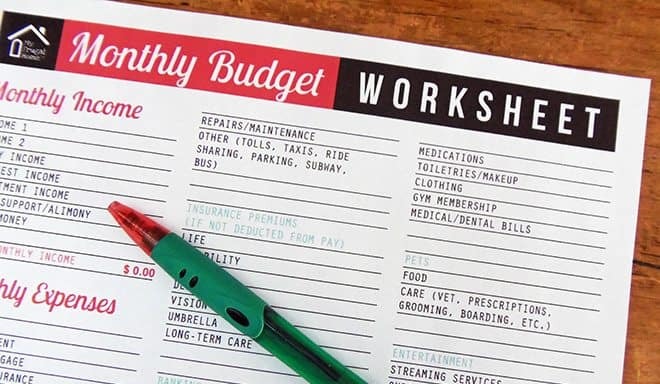 If you end up having less than you need, you can always go back and braid some more. It’s a pretty forgiving project. I wanted to make a really colorful rug, but I still wanted it to have a bit of a pattern to it, so I tried to build that into my color choices as I went. As you can see, I used red, white and orange, until I ran out of orange. Then, I switched to yellow, and then I switched to blue. 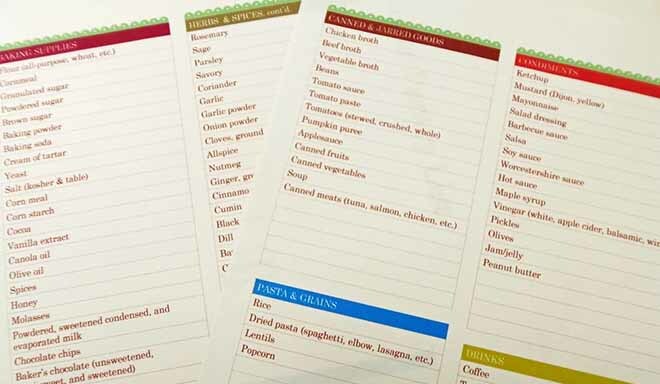 By keeping the red and white consistent through those three color changes, I created one unified section. As I worked, I did a section with white; then, I did one with navy. And I just keep flipping back and forth between the two. I think this gave the rug a more cohesive look. But it’s just one way to do it. 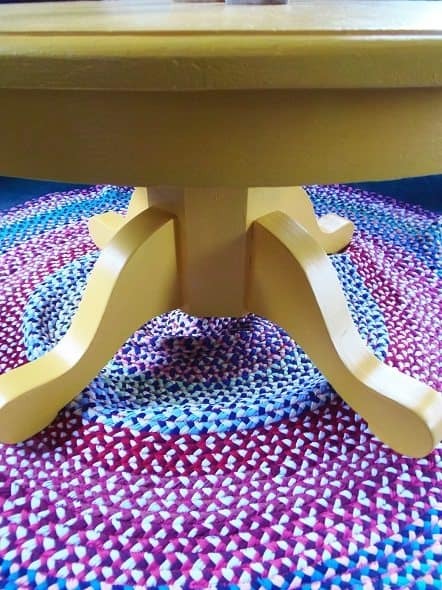 I’m only mentioning this because I know braided rugs traditional have sections of color, and if you want that, you need to plan it into your design as you go. 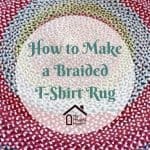 Once, you’re done braiding, it’s finally time to sew your rug together! 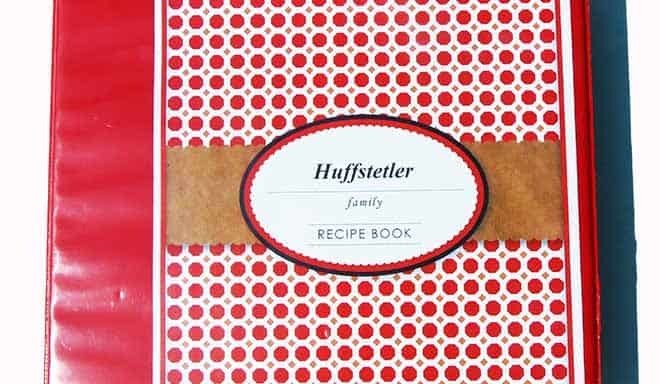 You can do it by hand, but I would definitely recommend doing it on your sewing machine. It’ll be loads faster. And if you have a large table that you can work on, do it. It doesn’t matter so much with a small rug, but if you’re making a big rug, it’ll definitely be easier if you have a large surface to support your rug as it grows. I worked on my dining room table, and I used every bit of that space. I was kind of worried that my machine wouldn’t be up for the task, but it did just fine (and yours will too). I would recommend replacing your regular needle with a medium-knit needle. A regular needle really isn’t up to the task. It’ll skip stitches. Once you have that taken care of, chose the largest zig zag setting on your machine. You’ve probably already decided if you want a round rug or an oval rug, but if not, you need to do that now. It’ll affect how you start your rug. Here’s how you start a circle rug. And here’s how you start an oval rug. 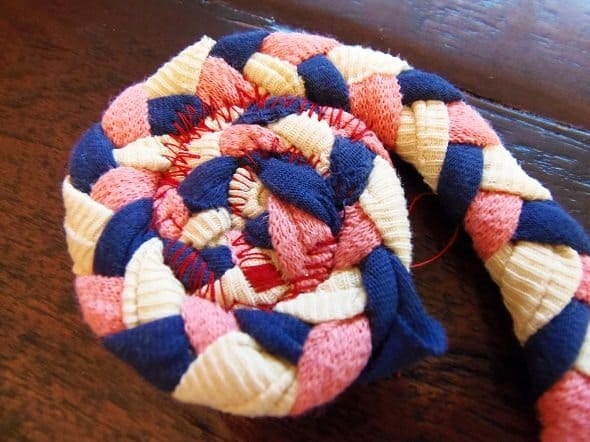 Notice that in both examples, the braids are arranged, so that they spiral out in a clockwise manner. This is super important. If your rug grows in a counter-clockwise manner, it’ll grow towards your machine, rather than away from it. Once you’re sure you have it configured properly, slide your braids up under the presser foot of your machine. It’ll be a tight fit, but just force it under there. 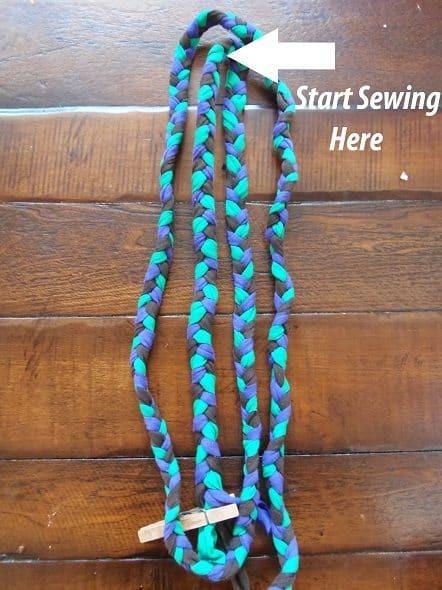 Then, start sewing your braids together. Just tuck the tail end of your braid under the next row of braids, and it’ll get stitched down and hidden. Your presser foot should have a little tick mark to show you where the stitching will go. 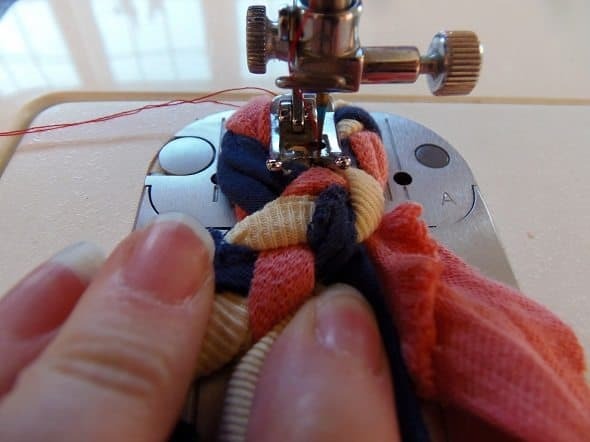 If you line that up on the seam between two braids, your zig zag stitches will do a good job of sewing the two strands together. The thickness of the braids is on the edge of what a consumer machine can handle, so don’t be surprised if it doesn’t advance the fabric (braid) for you. I had to move it forward manually. It’s easy enough to do, but it does get to be a bit of a workout, if you’re making a big rug. Braided rugs can get heavy in a hurry. 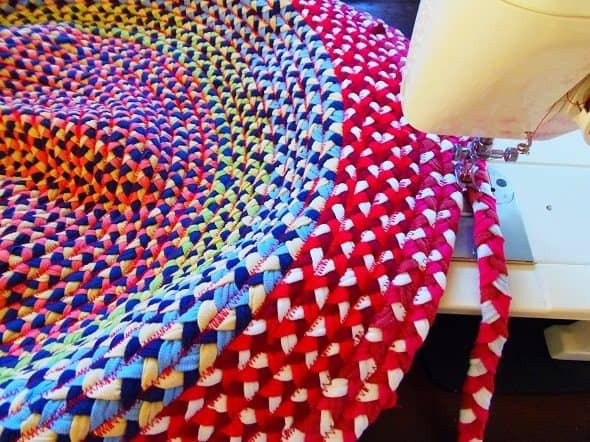 Knit is a very stretchy fabric, and if you pull your braids too tight while you’re sewing them together, your rug will try to curl in on itself. 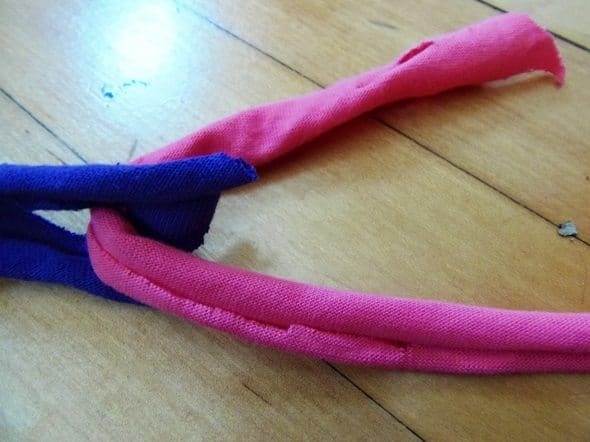 After a lot of experimenting, I discovered that if I pushed the braid forward, so that the strands bowed out a bit, while I was stitching them in place, it solved a lot of this. 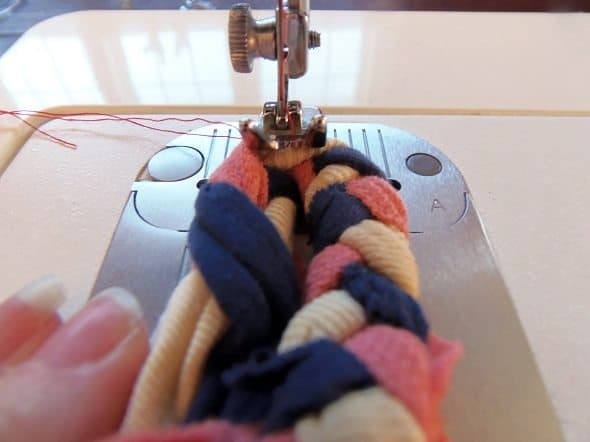 You definitely don’t want to pull the braid tight, while you’re sewing, because it’ll be at its tightest. 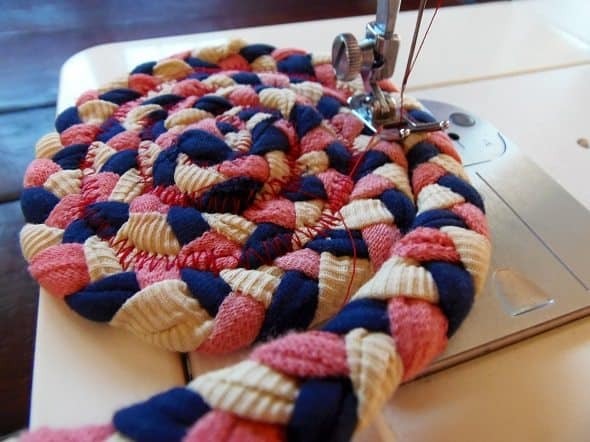 If you’re making an oval rug, you should also take care to sew a bit more braid into the turns. 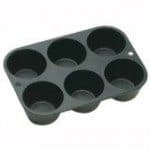 If you take them too tight, your rug is going to try to cup. 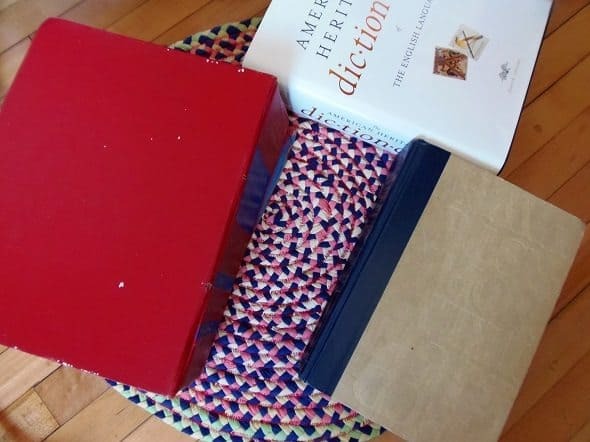 It took me more than one sitting to sew my rug together (it was huge), so I also laid dictionaries on top of it each night to help flatten and stretch it out. 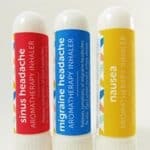 But bottom line: don’t stress it, if you rug ends up with a bit of curling or cupping. Knit is very stretchy stuff, and you can always stretch it until it calms down. Even walking on it over time will fix this problem. And now that I’ve explained all of that, just keep sewing around and around in circles (or ovals, as the case may be) until your rug is finished. I had one of my daughters help me support the rug towards the end, so it would be easier to work with. The weight of the rug was pulling it off the machine. When you get to the end of your rug, tuck the tail under the previous row, and sew it down. Full disclosure: this project will take a TON of thread. 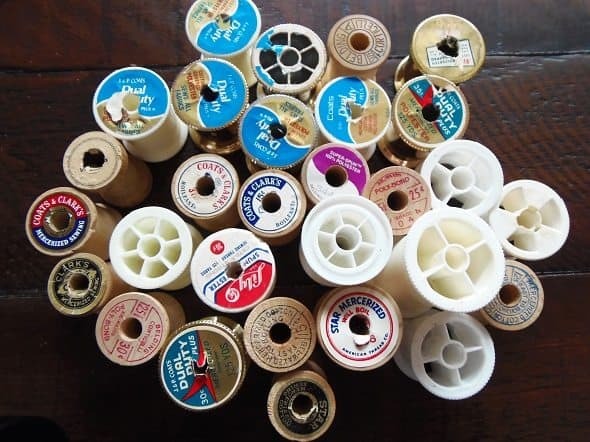 My mother-in-law gave me her sewing stash a couple years ago, so this was a great project to use up all of those partial spools. But if you want to make a big rug, and you don’t have any thread on hand, just know that you’re going to have to spend some money on thread. It isn’t as cheap as it used to be. And expect to use more than one needle, if you’re making a large rug. I broke one, and had to replace another when it got dull. 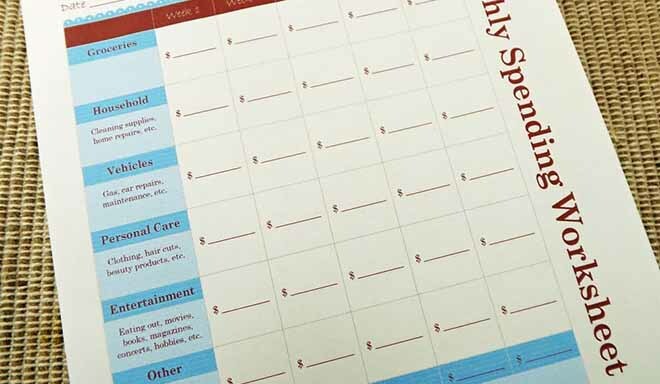 You’ll definitely save yourself some aggravation, if you start with extra needles on hand. I hate having to run out for supplies in the middle of a project. I ended up having more braids than I needed, so I just cut off the extra, and I plan to use them to make a scatter rug (or two). 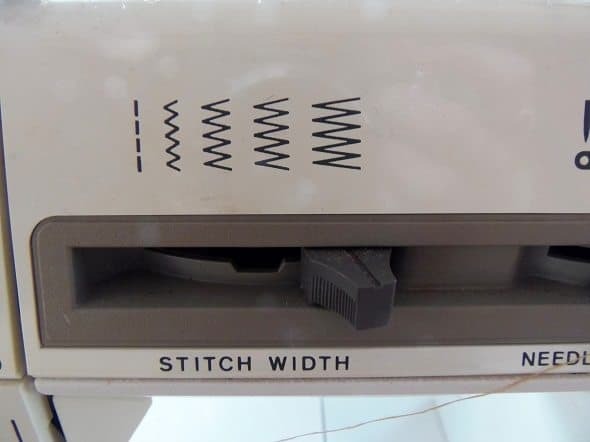 If your machine skips stitches, just go back over the area a second time. If that doesn’t work, or you find that it’s happening frequently, consider switching to a heavy-weight knit needle (size 100/16). 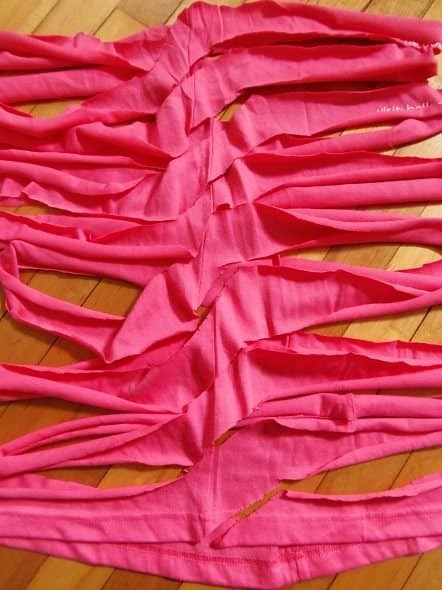 You can make yarn out of the tops of shirts, too. You just have to cut them differently. Lay one out on your work surface, so that the neckline forms a circle in the middle. Then, measure two inches up from the edge, and cut around the shirt in a spiral, maintaining your two-inch width, until you get to the center. You can include the ribbed neckline or not. The choice is yours. I would probably leave it off. I think my braided rug looks great with the hand-me-down coffee table that I just painted. Erin, that is gorgeous! Great job! Thanks, Mackerel. 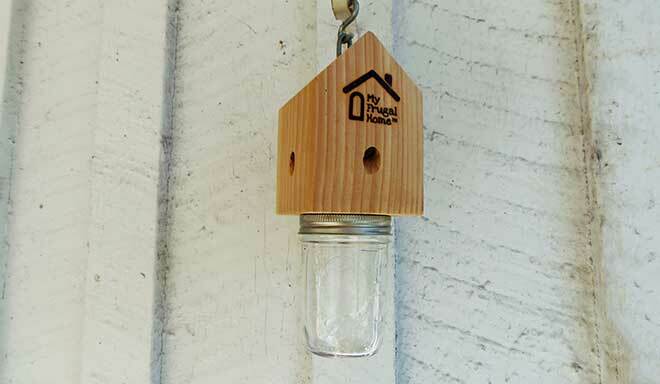 It was a fun project. I plan to tackle another one soon. You know, thank you for printing. 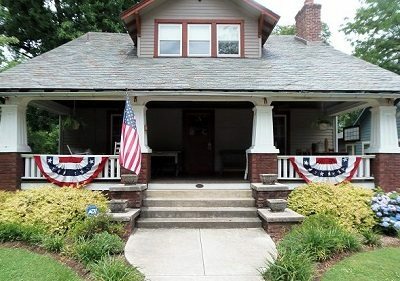 Any idea on how to hand sew floor rugs? 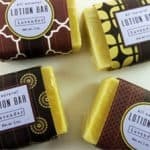 I have some my Grandma made, and they need repair. They might be too big to get under my presser foot, although that sounds nicer! Yep. You can do the same thing with needle and thread. I’d probably use upholstery thread, since it’s sturdier. It’ll hold up better to all the tugging when you pull the thread tight. Regular thread might break. 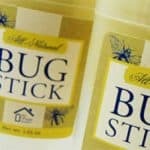 Another option would be to double up regular thread, so it’s sturdier. 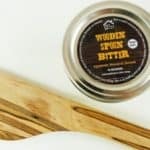 Aside from that, a simple whip stitch should take care of any repairs you need to make. Hope that helps. It’s wonderful that you have some of your grandmother’s handmade rugs. They’re definitely worth preserving. Awesome project, came out looking amazing! 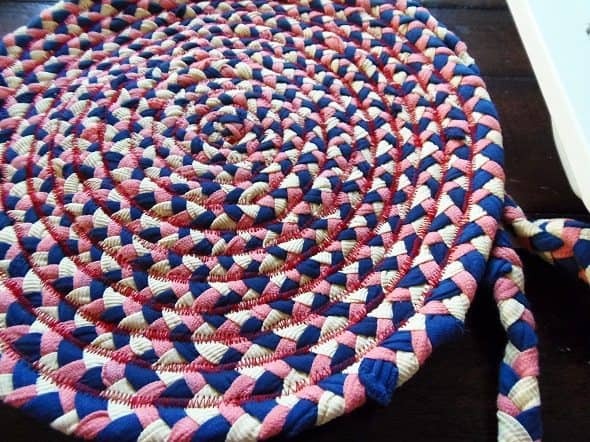 There use to be 3 metal items that was used to make braided rugs. They looked like the material would automatically roll into three individual braids as you were braiding them. 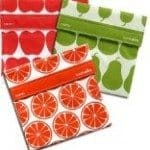 It made me think of how you use to make a rolled hem on a sewing machine. 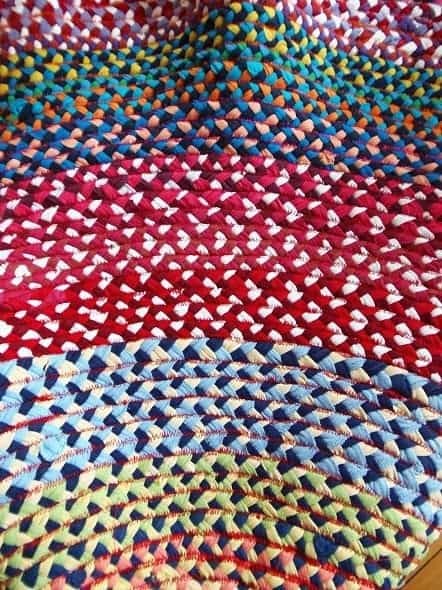 Braided rugs are very nice and a good way not to waste material.